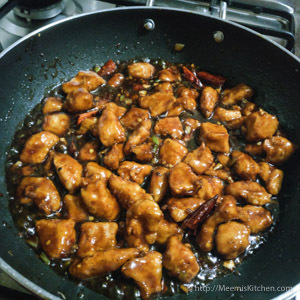 Honey chicken is a popular Asian dish that can be easily prepared at home with simple ingredients. 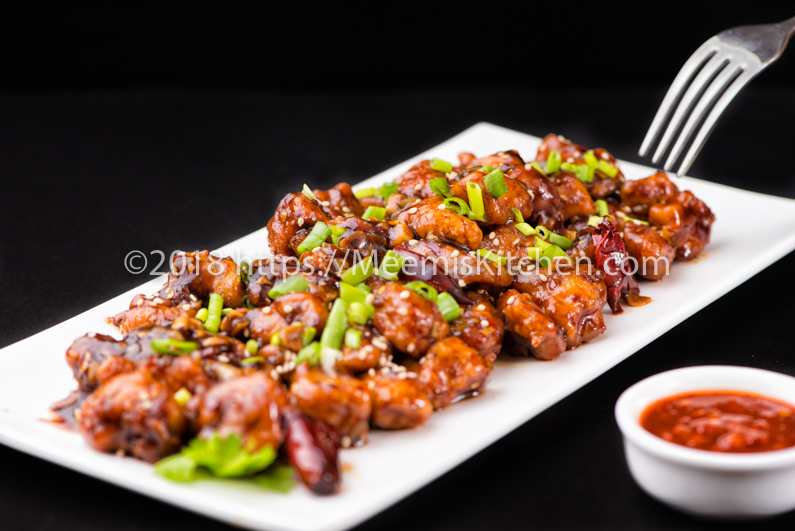 There are many versions of Honey chicken; Some are sweet and sticky chicken dishes and some are equally spicy with a wonderful glaze and feel. 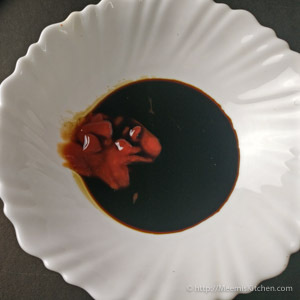 I have modified the recipe to make it spicy and sweet, perfectly balancing the flavours to make a delightful appetizer/ starter or side dish. The whole family loved this version of Chinese Honey chicken and the plates were licked clean! Happy cook and happy tummies! Preparing this Honey chilly chicken was quite easy. I was careful not to cook the honey though. Ayurveda stresses on the health benefits of honey and advices to have it raw due to its natural healing properties. However, cooking honey in high temperatures cause ill effects to digestive system as per Ayurveda. The maximum temperature advised is 40O C. Hence, I modified the recipe and added Honey after taking it off the flame. Since very less water/ chicken stock is added, it is a dry chilli chicken dish with the gravy coated on chicken pieces. It can be served as an appetizer for parties, or along with Fried Rice or Noodles. Do check out my other chicken short eats like Chicken 65, Thattukada style chicken fry, steamed chicken momos etc. Eat more vegetables along with your protein as you need more immunity to resist those frosty attacks! Try and include soups in your menu, it will soothe your throat and help you from excessive indulging! All said, I can’t resist sharing this recipe with you. Enjoy the perfect blend of sweetness and spiciness of Honey Chicken. Pair it with Chilli Garlic Fried rice for a mouthwatering weekend dinner. Wishing you all a healthy New year! 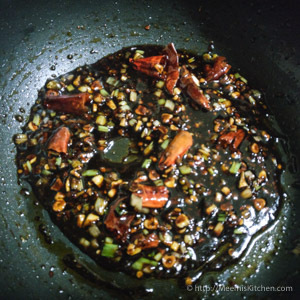 Soy Sauce : 2 ½ tbsp. Sesame seeds (optional) : for garnishing. 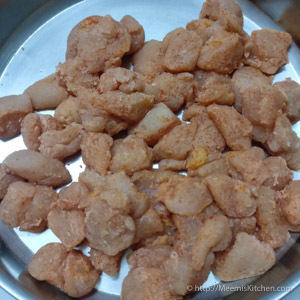 Clean and cut the chicken into small bite size portions. 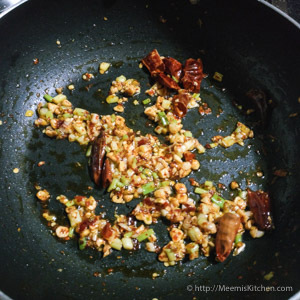 Mix Maida, Chilli powder and salt. Coat the chicken pieces with this flour mix. Shake off excess flour. Make a thin batter with Corn flour, Pepper powder, soy sauce, salt and water. Dip the chicken pieces in batter and fry in oil till golden brown. Keep aside. 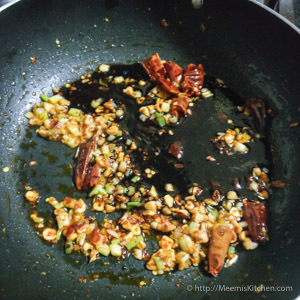 Remove excess oil and fry finely chopped garlic, ginger and Red chilli. Add chopped spring onion whites and Crushed Chilli. Pour Soy sauce and tomato sauce. Mix corn flour in little water/ chicken stock and add to the gravy and stir to thicken the gravy. Adjust the salt. Transfer fried Chicken pieces to gravy and combine to coat the pieces. Take off from the flame and keep aside. Once the steam settles, add honey and combine well. Transfer to a serving plate and garnish with chopped Spring onion greens and toasted sesame seeds. Serve Honey Chilli Chicken with Fried rice, Noodles, Naan or enjoy it as a starter. Honey has natural antioxidants and is great for your diet. However, cooking destroys all enzymes that facilitates healing properties. 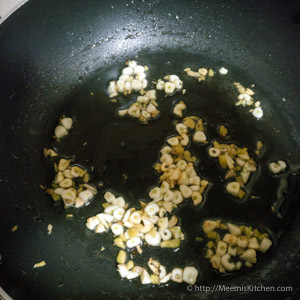 Garlic, Honey and Ginger has great medicinal properties and makes the dish healthy. Always add honey after the flame is switched off. Heating honey is not advised. Always be careful with salt while making Chinese dishes as the sauces are salty. 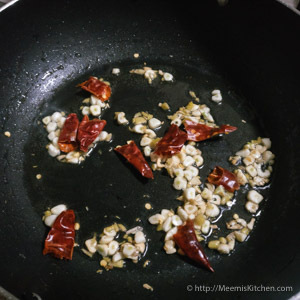 Adjust the measure of Red chilli and chilli flakes to suit your taste. Garnish with toasted sesame seeds to make it more appealing. Please try this Glazed Honey Chicken recipe and let me know if you like it or share with your friends through the share buttons on the side. It will definitely inspire me to add more homemade recipes for you. Thanks and God Bless! !